With Oskar busy building bots, Emilie spends her time fishing and painting and hanging out in the community center. 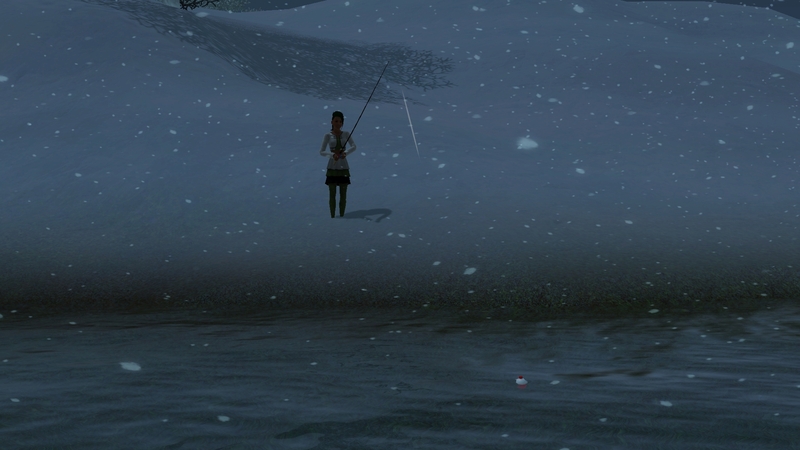 She is making great progress on catching her perfect fish, up to nine varieties now. Oskar spends his days building, upgrading, and selling bots. He is very close to reaching the top level of the career and he thinks it would be a good idea to take a couple of bots home. 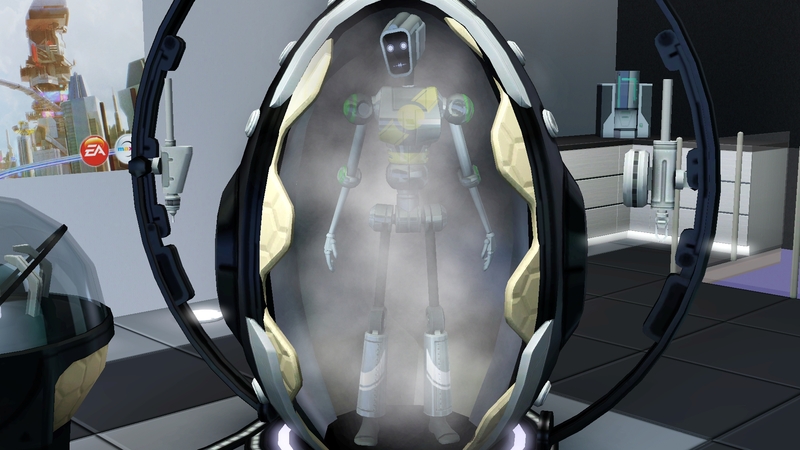 He also still needs to finishing designing the nanites and trait chips. Elita is an Awesome (level 6) green floating bot and S.I.M. 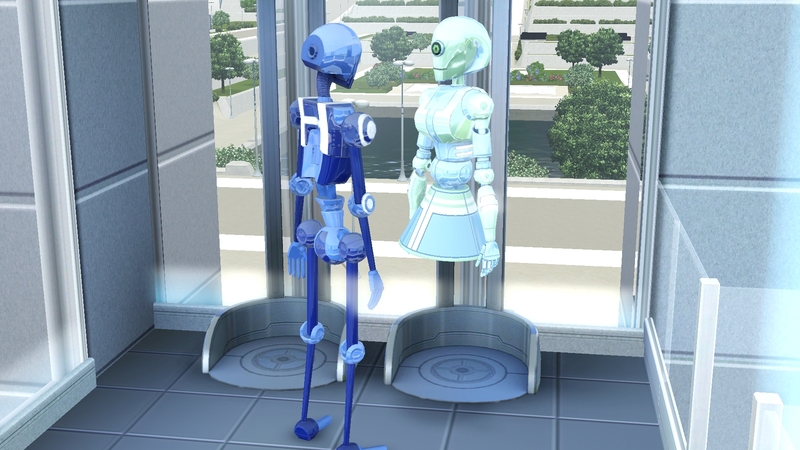 is a regular Next Gen (level 9) blue bot. Both will achieve both future tech and sentience back in the present time and then Oskar will return them to the future to sell them. 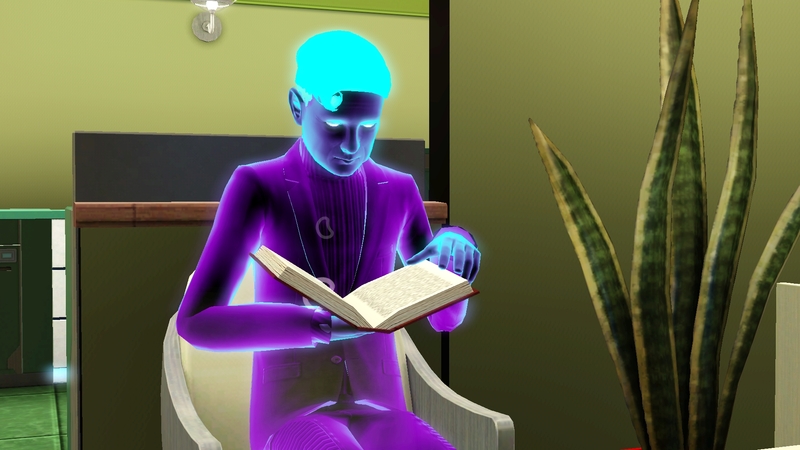 Things That Go Bump In The Night is the name of the book that ghosty Wade is reading when the gang returns from the future. Oskar spends his next few hours tuning up both S.I.M. and Elita until one reaches future tech quality. 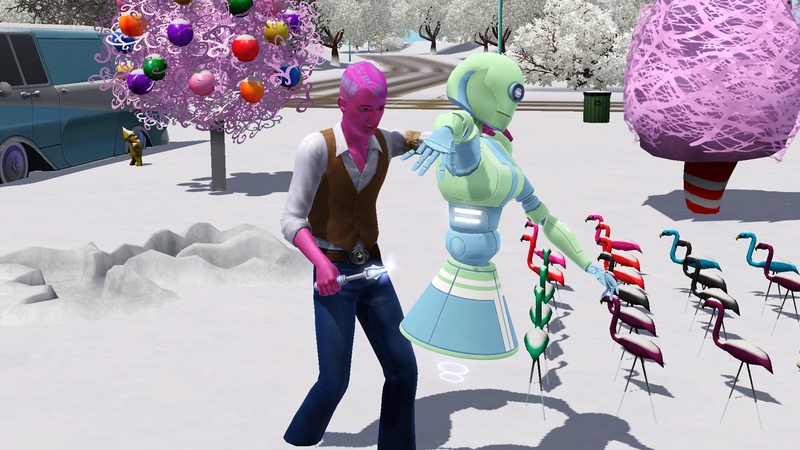 At this point he adjusts S.I.M.’s trait chips to include Simulated Emotions, Steel Chef, Solar Powered, Capacity to Love, Limitless Learning, Sense of Humor, and Sentience. With one down, Oskar turns his attention to Elita, who had a longer way to go. S.I.M. is apparently female also. Not only does Oskar complete his lifetime wish, he also becomes a Pioneer of Plumbotics and is rewarded with a legacy statue in the future. Once Elita is upgraded to future tech, she is given the traits chips for Sentience, Competent Cleaner, Friendly Functions, HandiBot, Mood Adjuster, RoboNanny, and Steel Chef. And the Time Traveler is a ghost also? Emit Relevart. Hmm. Although that would make sense as he first appeared when Wade and Molly moved into the house. 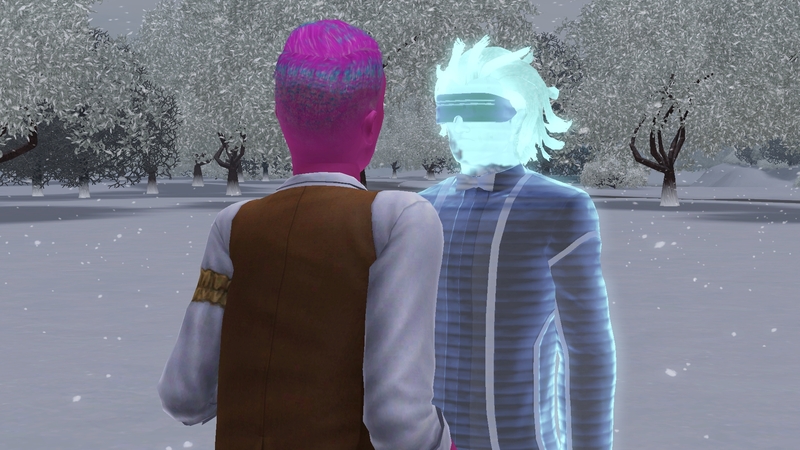 Or, is he a hologram congratulating Oskar on having a legacy statue in his honor. With these requirements completed, Oskar makes a quick trip back to the future in order to sell the bots and reach the top of the bot building career. It would have been nice to keep the bots, but the house will be too full already. Emilie continues to work on this last couple of perfect fish and then it is painting time and baby time. 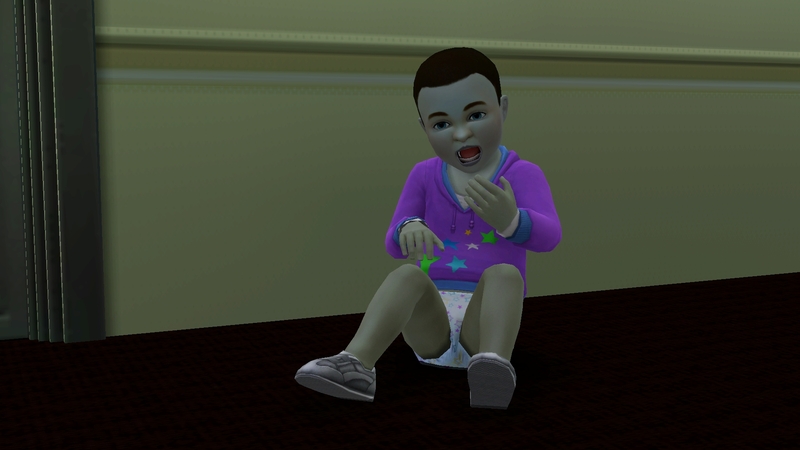 Jeffery becomes a toddler and I resist the urge to fix his clothes. With Oskar working on his second career and having completed his requirements, the focus is on Emilie. She will need to catch the remaining perfect fish, master painting skill and career, and pop out three pregnancies. Wow! 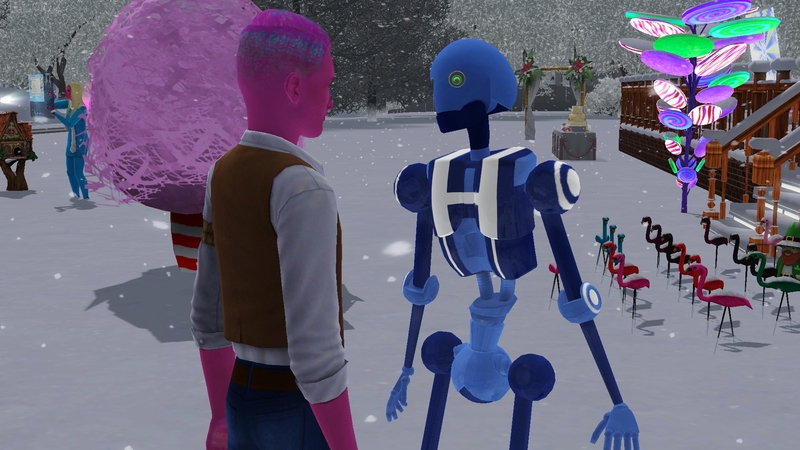 I can’t believe you completed all that Bot stuff! I haven’t even messed with it, and it looks pretty cool!